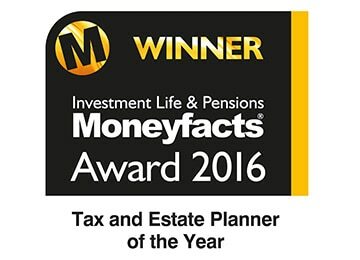 We were delighted to win the 2016 Moneyfacts Tax & Estate Planners Award. The award followed a rigorous selection process, including a written submission from us and feedback from our clients. Winning such a prestigious award was only possible after significant investment in our team, without which we wouldn’t be the business we are today. The 2016 win wasn’t a one off either. Over we have been commended or highly commended every year for the past five years, previously winning the same category in 2014. As part of the financial planning process we consider the implications of Inheritance Tax (IHT), Capital Gains Tax (CGT) and income tax. Please note: The Financial Conduct Authority (FCA) does not regulate Tax and Estate Planning.